A complex that includes the protein HP1 binds to specific regulatory DNA sequences to promote local compaction of genomic regions and inhibit associated genes that drive differentiation of specific cell lineages. Kristoffer N. Jensen is in the Department of Medical Genetics, Life Sciences Institute, University of British Columbia, Vancouver, British Columbia V6T 1Z3, Canada. Matthew C. Lorincz is in the Department of Medical Genetics, Life Sciences Institute, University of British Columbia, Vancouver, British Columbia V6T 1Z3, Canada. Mutations in the gene that encodes activity-dependent neuroprotective protein (ADNP) cause the rare neurodevelopmental disorder Helsmoortel–Van der Aa syndrome, which is characterized by intellectual disability and autism spectrum disorder1. In a paper in Nature, Ostapcuk et al.2 present a detailed study of the function of this transcription factor. They show that ADNP forms part of a nuclear complex that plays an essential part in maintaining the fidelity with which pluripotent stem cells give rise to the three primary cell lineages in the human body. DNA is intimately associated with many proteins, including transcription factors and the histones around which it is packaged. Together, this DNA–protein complex makes up chromatin. Gene-poor genomic regions, which are associated with low levels of transcription, adopt a condensed chromatin structure known as heterochromatin, whereas gene-rich regions adopt a relatively open structure called euchromatin. Although ADNP is associated with heterochromatin3, it has been unclear whether this interaction is relevant to the traits seen in ADNP-deficient mouse embryos — which include defects in the formation of the structure that gives rise to the brain and spinal cord, and aberrant expression of genes normally expressed in the extra-embryonic cells that support embryo development4. In addition, the spectrum of ADNP’s genomic targets in euchromatin has remained undefined. Ostapcuk et al. isolated the DNA sequences bound by ADNP in mouse embryonic stem (ES) cells — a type of pluripotent cell derived from mouse embryos. They identified about 15,000 genomic sites at which ADNP was bound, most of which lay within genes or in nearby regulatory sequences that control gene expression. The authors showed that the expression of many of the genes that were bound by ADNP in wild-type mouse ES cells was upregulated in cells genetically engineered to lack this factor, supporting a direct role for ADNP in transcriptional repression. A subset of these genes encode proteins that promote differentiation into specific extra-embryonic or embryonic tissues, in particular of the endodermal lineage (one of the primary cell lineages, which gives rise to the digestive and respiratory tracts). And, whereas wild-type mouse ES cells cultured under conditions that promote neuronal differentiation gradually became more neuron-like, ADNP-deficient cells failed to do so, and showed aberrant expression of endodermal genes. Next, to determine whether ADNP mediates transcriptional silencing by recruiting co-repressors, Ostapcuk and colleagues used an unbiased approach to identify proteins that interact with ADNP. Their screening yielded two types of chromatin-associated protein. The first, CHD4, is a chromatin-remodelling protein previously implicated in the control of genes associated with pluripotency and differentiation5. The second, HP1, has a role in transcriptional repression and packaging of heterochromatin. Together, ADNP, CHD4 and HP1 form a stable complex that the authors dubbed ChAHP. ADNP probably interacts with HP1 proteins through a well-documented HP1-binding domain in ADNP called a PXVXL motif4. There are three HP1 isoforms (HP1α, HP1β and HP1γ), but Ostapcuk et al. found that only HP1γ and, to a lesser extent, HP1β interacted with ADNP, consistent with a report published earlier this year6. Furthermore, the authors showed that most genomic regulatory regions bound by ADNP in wild-type cells were also bound by HP1γ and HP1β. By contrast, another study showed that ADNP does interact with HP1α in embryonic cancer cells4. Reconciling these apparently contradictory results, Ostapcuk et al. found that ADNP can interact with HP1α, but only in the absence of HP1β and HP1γ. When the authors examined cells lacking different combinations of HP1 isoforms, they found that all three had to be deleted to mimic the effects of ADNP mutation on gene expression. This indicates that the three HP1 proteins are functionally redundant — that is, they can compensate for one another in ChAHP. Why might ADNP preferentially interact with HP1γ and HP1β? HP1α has an amino-terminal region, unique among HP1 proteins, through which it promotes the self-organization of heterochromatin into liquid-like droplets7. This process, called phase separation, probably minimizes interactions with other nuclear proteins, maintaining the condensed state of heterochromatin. However, ChAHP-mediated silencing of euchromatic genes must be reversible to enable genes to respond to differentiation cues during development, perhaps making phase separation less desirable at these genomic regions. HP1 proteins interact with PXVXL-containing factors such as ADNP through a carboxy-terminal ‘chromoshadow’ domain. But in heterochromatin, HP1 binds histone H3 through an evolutionarily conserved amino-terminal chromodomain8, at sites where the histone is tagged by methyl groups on amino-acid residue lysine 9 — a chemical modification dubbed H3K9me3. It is through this interaction that HP1 proteins induce chromatin condensation. Might H3K9me3 also promote HP1 binding at ChAHP-bound regions? 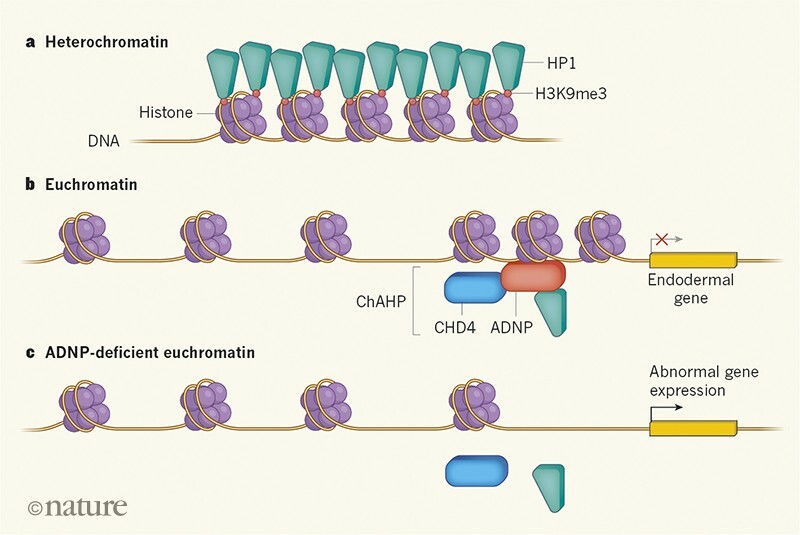 In favour of this hypothesis, HP1 can recruit ADNP to H3K9me3-marked heterochromatin3. However, Ostapcuk and colleagues show that ChAHP can efficiently bind to its DNA targets even if HP1 is engineered to lack its chromodomain. Furthermore, regulatory sequences bound by ChAHP lacked H3K9me3. Therefore, H3K9me3 is unlikely to have a role in ChAHP-mediated transcriptional silencing. People with Helsmoortel–Van der Aa syndrome generally have ADNP mutations that produce a truncated protein lacking the DNA-binding domain and the PXVXL motif9. To investigate whether this mutation disrupts ChAHP-complex formation, Ostapcuk et al. 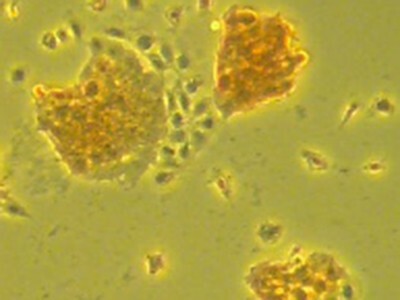 expressed one such patient-derived mutant protein in mouse ES cells. The mutant ADNP failed to bind to HP1β or HP1γ, and genes normally bound by ChAHP were aberrantly expressed. Furthermore, analysis of chromatin accessibility in ADNP-deficient ES cells revealed that the mutation led to opening of chromatin in regions immediately flanking ADNP-binding sites. Together, Ostapcuk and colleagues’ findings demonstrate that ChAHP does not generate broad swathes of heterochromatin, as observed at H3K9me3-marked regions bound by HP1. Instead, the complex generates focused regions of condensed chromatin that inhibit the transcription of differentiation-promoting genes. Aberrant expression of such genes in the absence of the ChAHP complex is probably a crucial factor in the aetiology of Helsmoortel–Van der Aa syndrome (Fig. 1). Figure 1 | Controlling gene expression through chromatin compaction. DNA is packaged around histone proteins in a complex called chromatin. a, HP1 proteins bind to methyl groups on histone H3 (a chemical modification called H3K9me3) to promote large-scale condensation of DNA into heterochromatin — a structure associated with transcriptional repression. b, Ostapcuk et al.2 report another role for HP1 — interacting with the DNA-binding protein ADNP and the chromatin-remodelling protein CHD4 in a complex called ChAHP. This complex promotes local condensation of chromatin independent of H3K9me3, in regions of otherwise loosely packaged chromatin called euchromatin. Such binding inhibits the expression of associated genes — including those that promote stem-cell differentiation into cells of the ‘endodermal’ lineage. c, In cells devoid of ADNP, the ChAHP complex is disrupted and CHD4 and HP1 are not recruited, resulting in locally decondensed chromatin, abnormal gene expression and spontaneous stem-cell differentiation. Although Ostapcuk and co-workers’ study focused on the interplay between ADNP, CHD4 and HP1, the researchers found many fewer genes upregulated in mouse ES cells lacking ADNP than in those lacking all three HP1 isoforms. And, consistent with previous reports10,11, the authors’ analysis of HP1-interacting proteins revealed a plethora of overlapping and isoform-specific binding partners, many of which have DNA-binding activity. Notably, mutations in several of these HP1-interacting transcription factors are implicated in other rare syndromes associated with intellectual disability, including in genes that encode the proteins AHDC112, CHAMP113 and POGZ14. Thus, it is tempting to speculate that HP1 proteins act as co-repressors for many as-yet-undescribed DNA-binding complexes that regulate the expression of distinct gene sets. Helsmoortel, C. et al. Nature Genet. 46, 380–384 (2014). Ostapcuk, V. et al. Nature 557, 739–743 (2018). Mosch, K., Franz, H., Soeroes, S., Singh, P. B. & Fischle, W. PLoS ONE 6, e15894 (2011). Mandel, S., Rechavi, G. & Gozes, I. Dev. Biol. 303, 814–824 (2007). Zhao, H. et al. J. Biol. Chem. 292, 8507–8519 (2017). Zaidan, N. Z. et al. Stem Cell Rep. 10, 627–641 (2018). Larson, A. G. et al. Nature 547, 236–240 (2017). Lachner, M., O’Carroll, D., Rea, S., Mechtler, K. & Jenuwein, T. Nature 410, 116–120 (2001). Gozes, I., Yeheskel, A., & Pasmanik-Chor, M. J. Alzheimers Dis. 45, 57–73 (2015). Hauri, S. et al. Cell Rep. 17, 583–595 (2016). Nozawa, R.-S. et al. Nature Cell Biol. 12, 719–727 (2010). Xia, F. et al. Am. J. Hum. Genet. 94, 784–789 (2014). Tanaka, A. J. et al. Cold Spring Harb. Mol. Case Stud. 2, a000661 (2016). Ye, Y. et al. Cold Spring Harb. Mol. Case Stud. 1, a000455 (2015).